Hi and welcome to my website….. 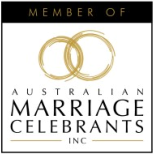 When I was appointed as a Marriage Celebrant in 2004, I had no idea of what was ahead for me and that I was embarking on a career that would make me feel like I had the best job in the world. I always feel so privileged to be involved in helping make a Wedding one of the most memorable days in a couples lives. I always tell my couples that getting married is a very important day but you need to relax, have fun and just enjoy the moment and it’s my job to make sure this happens and when you look back on your wedding day, even after years of marriage, I hope that all your memories will come flooding back and bring a smile to your face. People often ask me what my style is, well my answer to that is friendly, relaxed and nurturing. I’m not one of the younger Celebrants, but I’m not too old either…. I’ve been married for over 20 years and am a proud mum. I absolutely LOVE being a Celebrant, helping people on one of the most memorable days of their lives so give me a buzz for a chat about your plans – I’d be happy to help you….